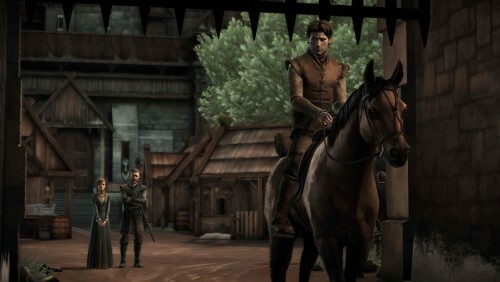 The newly released first episode of the Game of Thrones adventure game from Telltale Games—a company that’s been around since 2004, creating adventure games of all sorts, but which only fairly recently rose to prominence with the critical acclaim for its The Walking Dead game—has certainly drawn some attention. Reviews have varied (see Polygon at one end, IGN at another, and Rock, Paper, Shotgun is always worth reading) but everyone certainly seems to feel that they’ve captured something of the Game of Thrones TV series in its tone and style (even if, in certain areas—the sexual content, namely—it’s toned way down [so far]). I myself have had a little experience of Telltales’ games, but from their pre-TWD period when the games they produced (such as the licensed Back to the Future and their first episodic title, Sam and Max: Season One). These were much more traditional adventure games, and were solid-to-pretty good. But the real boom of success that The Walking Dead brought—a success that has led to their Fables: A Wolf Among Us game based on Bill Willingham’s comic book series, and more recently Tales of the Borderland based on the popular FPS—was also paired with a very different approach to the adventure game. At the outset, Telltales Games made very traditional adventure games. No surprise there, really: several members of the company came there by way of Lucasarts, famous for its adventure games such as The Day of the Tentacle, Sam and Max Hit the Road, and the Secret of Monkey Island series among others. Those games generally featured a lot of puzzles, and while they had strong central narratives you had relatively little control over it. You might end up with two or three different end states, with some minor variations in the mechanics of how to get from point A to point B, but your character’s interactions would have little lasting impact in terms of the dynamics of character relationships. The characters would generally always think of you in the same way, regardless of what you did. It has been mooted about for awhile—ever since it was first announced that season 5 of Game of Thrones would film in Spain—that one of the locations that was under consideration was the Andalusian town of Osuna. Full of history, Osuna features some noteworthy buildings—the University of Osuna building was declared a monument, and the Colegiata church across from it is a noteworthy example of Renaissance architecture—and the arid landscape so common in Andalusia. It seems, on the face of it, an excellent location for filming scenes for the new season. But speculation turned to one particular possible site for filming in Osuna: the Plaza de Toros of Osuna. Built in the early 1900s, it is a substantial bullring, capable of holding 6,500 specatators and has one of the largest diameters of any bullring in Spain. Many saw photos of it and immediately pronounced it a perfect location for a key sequence from A Dance with Dragons which many speculate will be part of this season. What we saw, however—and what, we think, a few others have seen—was a building whose sole reason for existence was the long-held tradition of the bullfight. Bullfighting has been romanticized by many notable persons over the years—Hemingway is an obvious example—and it continues to be a significant attraction in parts of Spain, particularly Andalusia. One does not simply… NOT say hi to Kristian Nairn! 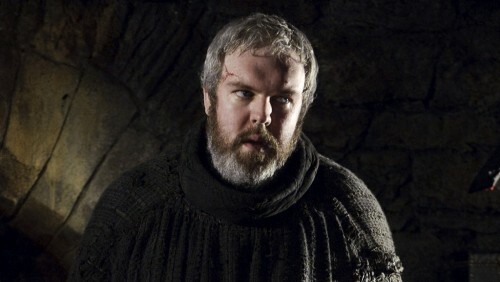 Why do we all LUV Hodor? What’s in a name (a name repeated once and again and again)? You are so NOT finding it out here! Woot. Not what I expected. Yeah, the “H-word”. Yeah, “hi” is an “H-word”; I meant the other one. The one with “Ho”. Hehe. “Ho”. MARINO: Kristian, thank you so much for taking the time to chat with us. KN: No problem, you are welcome! 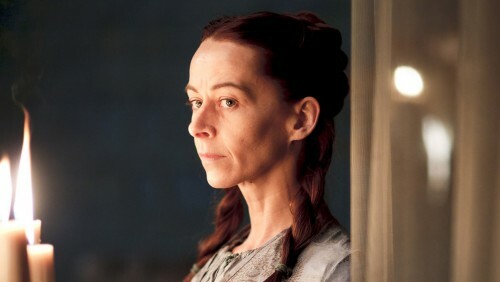 There are a number of more or less obvious differences between Ms. Kate Dickie and Lady Lysa Arryn. Firstly, Kate is blonde. Yeah, I know. And it makes you look twice, as in “am I in the right queue?” Another major difference has to do with her mouth. Kate’s mouth only knows about smiling; a mirthful, joyous laughter that can be heard at quite some distance emerging from it. 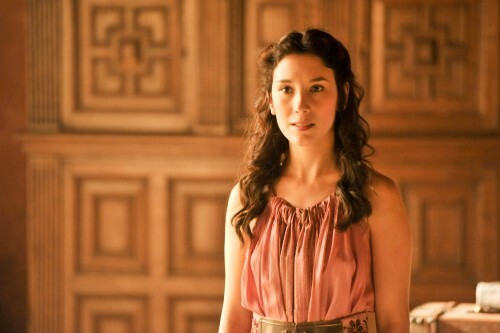 Lysa, she was not too much into the “being happy” attitude. Finally, Kate Dickie is not a jealous, tortured soul full of regret who breastfeeds her eight-year-old son. At least not that day, as far as I know. Since my back was already pretty mauled, I chose to kneel opposite the Lady Lysa, much to her surprise. While she greeted me and I prepared my recording thingies we engaged in some small talk, mostly my going all “OMG YOUR SCOTTISH ACCENT IS SO CUTE!” and Kate going “OMG I NEVER REALIZE I HAVE AN ACCENT!” We were kind of shouting, yes. MARINO: Hi Kate, thank you for being here (wherever here is now!) There is this famous sentence which Jaime Lannister utters, “the things I do for love”, to justify his actions. Does Lysa feel the same? It occurred to me that being thrown down the Moon Door is no laughing matter, but since I have no actual experience, I chose not to press the matter further. I know nothing! 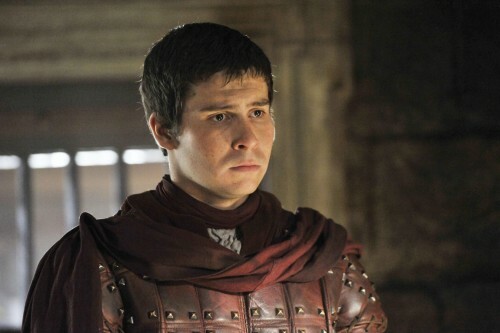 Daniel Portman may share some traits with young Payne. As opposed to Finn Jones and Gethin Anthony’s more openly extrovert demeanor, the Glasgowite looks more serious and contained. Ultimately, he is a most polite and straightforward lad who just seems a bit overwhelmed by the magnitude of the Con. Welcome to my world, Pod! MARINO: Hi Daniel, thank you for taking these questions. Gethin sounded like Renly but looked like a normal guy. A normal, very handsome, guy, that is. His hairstyle was way cooler than in the series, IMHO, and the many girls queuing in front of me seemed to agree and approve the whole package, judging by the pretty heavy swooning and giggling. 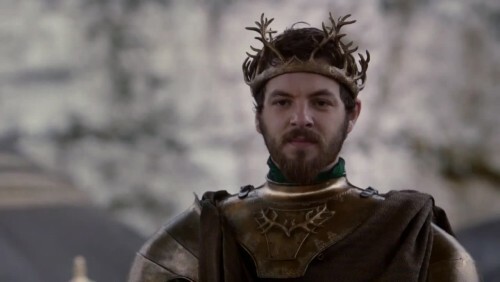 Such was the presence of the late Renly Baratheon, First (and Last) of His Name! The man did seem to be having a good time: he smiled and laughed profusely, shook hands a-plenty, spoke cheerfully and had nice words for all and each fan, all while deftly personalizing the items people offered him. And he still found the time for posing for more selfies per minute than the World Health Organization would recommend. When my turn was about to come, I felt I might squee a little, but I managed to contain any inadmissible sounds within my vocal apparatus. Gethin stood up to greeted me (so nice of him; 100 points to House Baratheon) after washing his hands clean with some sort of magickal elixir. His grip was strong, as one would expect from a king wearing a t-shirt and a pair of jeans. Gethin: Hey Marino, how’s it going? Marino: Thank you very much for taking the time to talk to me. Gethin: Nononono, don’t be silly, that’s awesome. Just like his alter ego, the Knight of Flowers, Finn Jones is a very passionate, energetic individual. Understandably, the fans are really pleased with his enthusiasm; he does get carried away while chatting, and I could hear him utter the “F-word” more than once (tee-hee!) His slender frame and that mop of quasi-alive curly blondish hair are quite striking, even more so with him sitting close to the mighty Kristian Nairn. Marino: OK, let’s try this… Hello? Finn stretches his body from the other side of the table and with the grace of a shadowcat starts throwing words at the device. “Man, he speaks fast,” I find myself thinking. I wish the few thousand people around would lowered their voices a few decibels, but since it seems unlikely, I ready my ears and buckle up to fight Ser Loras Tyrell in the merciless arena of light-speed-interviewing. Marino: Finn, thank you so much for taking the time to answer these questions. We didn’t get to see much of you last season, but Loras is in a difficult place right now with his wedding looming on the horizon and all the politicking. How is he faring? FINN: Well, from my point of view… I haven’t seen the scripts for Season 5 yet so I don’t know what to think. As an actor you can have all these ideas of how you think a character should be, but until the writers write you what you are meant to think, you don’t really know. 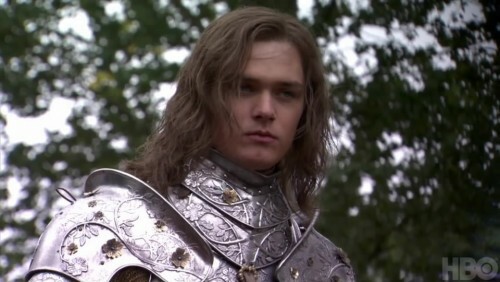 From my perspective, Loras is pissed off. He is PISSED OFF. He is pissed off with everything; he is pissed off that he has to marry Cersei… He is just pissed off. And I can imagine seen him quite hot-headed in Season 5, but again I don’t know what the scripts say so I don’t know what to think, I don’t know what Loras thinks just yet. Well-met, fellow ASOIAFers and AGOTers! This is Marino Santirso-Dayne, the Pale Dornishman, straight from Northern Spain. Pleased to meet you all! ... I mean, to properly engage in intimate and revealing one-to-ones while sipping Earl Grey, but imagine if you would an event with thousands upon thousands of attendees all looking forward to meeting their idols; it turns out it’s quite an ordeal to secure a few minutes with the guests, and once at the venue, the prospect of carrying a bone china tea set, however tempting, became much less appealing and practical than when I was daydreaming in my couch. For more of our videos, see our Youtube channel. And yes, we’re planning at least a couple of more videos—we say as much in the video—but if there’s any other topics people are keen on hearing our thoughts on, do say in the comments! Concluding our interviews from February, I had the chance to meet and talk with Isaac Hempstead-Wright—the adorable Bran Stark, who I had last met years ago during the first season filming—and Thomas Brodie-Sangster whose portrayal of Jojen Reed has been a study in maturity and understated performance. When Isaac saw me, his genuine pleasure at meeting again reminded me of the cheerful, enthusiastic child I’d met years earlier. He’s grown up in a lot of ways—I remarked that Kristian Nairn has mentioned how glad he is that he hasn’t had to carry Isaac on his back any longer thanks to that!—and he (and Thomas) both gave some very thoughtful answers to the questions posed. So, what can you say of any visions you have this season? Isaac: Over the series, we’ve seen Bran explore his mystical elements more and more. By season 3, with the arrival of Jojen, he definitely starts to understand it better and what this higher calling is. 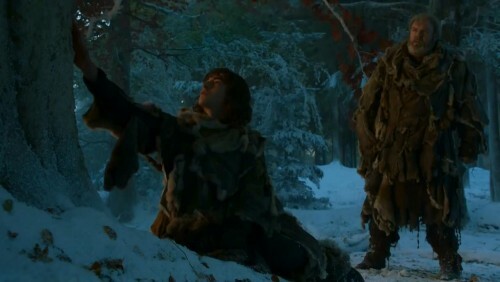 Season 4 continues this, and aiming at the pinnacle—at this supernatural force desperately pulling Bran towards it. In the books, Jojen knows the date of his death and what happens to him. Is this something present in the show? Thomas: I believe he doesn’t think the future is set, as such, but he gets senses and feelings. He just knows something, but without knowing it in its entirety. It’s a general feeling that he can’t really change and just has to accept. He’s aware of his own mortality, but this makes him calmer, more upstanding, clearer. Everyone dies, of course, but knowing when or where—or both—must ... Well, I wouldn’t want to know, but Jojen is quite cool about it. He’s accepting of it. That helps him have clarity. This past February, I had the opportunity to interview a number of actors in London. One of the ones I was most eager to meet—because she had been rather difficult to get an interview with previously!—was Sibel Kekilli, who plays Shae. Although given the early date of the interview it was difficult to approach anything discussing her big turn this season, it was a good chance to catch up with the actress. An award-winner in her native Germany for her powerful work in films such as Head-On and When We Leave, Kekilli proves to be a very enthusiastic interview subject—a lot of exclaimations, a lot of smiles, and not a little laughter. 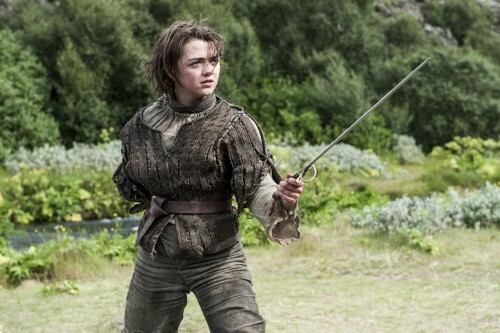 What was it like, when you first got involved in Game of Thrones? It was my first significant work in English, and for HBO as well. The first season, when I was auditioning in June 2010, we started filming not long after that. People didn’t know how long the show would last, that it may not even go to a second season, that I may just have a few episodes to do. So I was, okay, I liked the character, and I didn’t know where the journey goes so that’s interesting. I was very naive, I thought perhaps I’d die in the second season. But then it got a second season, and I said, “Oh, I don’t want to die! I want to be on it as long as I can!” I was so proud to be part of this big show. Continuing our interview series—this is the first of several we’ll release in the run up to the final episode of season 4—I had the pleasure of speaking to Liam Cunningham (who I’d interviewed back in Season 2) and Carice van Houten (brand new interview subject!) regarding season 4. Both were charming, as expected, and had great fun talking back and forth as they answered questions regarding their fondest memories, their weirdest scenes, and more. Carice, we know Liam prefers to learn the story through the scripts and was advised by the producers that he didn’t need to read the books. Do you feel the same about it? Carice: Same here, really. I’d like to know as little as possible because I’m such a big fan. When you’re in the zone and watching the show and then you see yourself… it can take you out of the story, so I’m watching the show just as many fans do and would rather not know too much. How would you describe the journeys of your character? 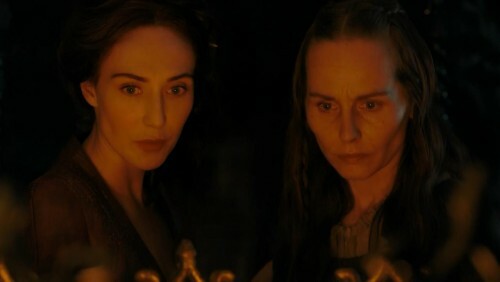 Carice: Where they’re going, I can’t tell you. But we’re learning more about their backgrounds, and we’re slowly revealing more and more. Melisandre is pretty complex… in a Dinsey world, you would call her evil, but in the modern, real world—and I think this is a modern story—it’s more complex than that, she’s not “just” evil. She’s not born evil, her methods may not be traditional but in her mind she’s not evil. She’s doing things for the greater good. Even the wicked stepmother in the fairy tales doesn’t act out of malice alone. She’s jealous, and she doesn’t know how to deal with her jealousy. That’s the way to play characters like that: they justify the deeds to themselves. It doesn’t mean that they’re good. One of the actors who has been most elusive among the regular cast has been Aidan Gillen. We’ve hoped to interview him for a number of years, but could never make it work… until, that is, earlier this year when I traveled to London to take part in a round of interviews with Gillen, as well as a number of actors. I recall back when the show was announced that all sorts of names flew about for various roles, but Gillen’s name was easily the most common fan suggestion for Petyr Baelish. Those suggestions were largely based on his role as Carcetti in HBO’s groundbreaking The Wire, I suspect, but I admit at the time I hadn’t gotten past the show’s first season so didn’t know him from there. But we here at Westeros.org also latched onto the name when it was suggested, because of his charming, fearless, devilish performance as Stuart Russel T. Davies’s Queer as Folk. With many notable roles under his belt, in film, television, and theater, the Dublin-born actor proves a very knowledgeable, extremely thoughtful interview subject. He takes his time with all his responses, thinking them through. And, as you’ll see, he’s more familiar than most of the actors with the source material…. 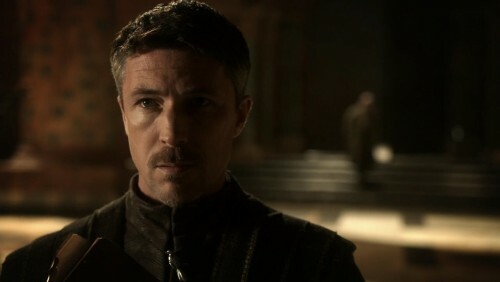 Without being too spoilery, what sort of character does Littlefinger takes this season? Literally a journey. At the end of season 3, I got a ship and sailed off. So I go to the Eyrie, and I don’t think that’s a secret. In terms of character development, what’s starting to happen is that I’m taking my surrogate parental responsibilities a bit more seriously, taking Sansa under my wings a bit and making sure Robin Arryn is okay. That’s mainly it. The Eyrie’s a big destination. Robin needs guidance—he’s only 10 years old—and there’s an interesting dynamic with Sansa as well. How much do you know about what lies ahead for your character? You’ve read the books, I know, but do you know what lies beyond that? I know as much as anyone whose read the books, or we’re about to. Anything after that… I don’t know, really. With Nikolaj Coster-Waldau, Bryan Cogman’s been the member of the Game of Thrones production we’ve had most opportunities to interview, and as always it’s been a pleasure as we range around various behind-the-scenes aspects of the production, as well as some in-depth discussion of Bryan’s work as a writer for this season in regards to “Oathkeeper” and “The Laws of Gods and Men”>. See below for the full interview, as we discuss filming in Iceland, the growth of the scale of the production since the early days, who Bryan’s idol is, and more! All right, welcome back to what’s turning into an annual chat, Bryan. I think Nikolaj’s the only person we’ve interviewed as often at this point. Hah. As I recall, this season included your first trip to Iceland for filming—usually none of your material was shot there, is that right? Trying to think… ah, there was one bit from “Kissed By Fire”—the encounter with Jon and Orell just before he and Ygritte go into the cave. That was Iceland. But, then again, D&D wrote most of that bit… And, of course, the interior of the cave was a soundstage in Belfast. So, yeah! Got to do Iceland. Funnily enough, though, apart from one scene, all the season four Iceland stuff features in D&D’s episodes. But I had the huge honor of being the sole writer covering the Iceland unit this year (apart from the Tormund/Styr scene in 401—D&D flew in to direct that). The one scene shot in Iceland from my episodes is the dragon popping out of that gorge. But, then again, I wasn’t on set for that! 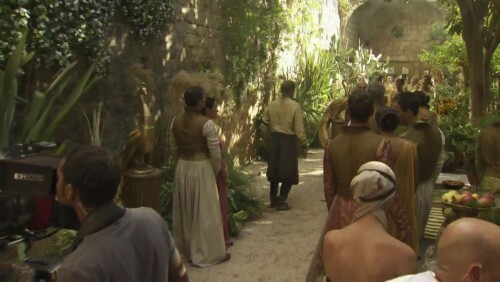 I was with Michelle on the other unit shooting the Arya/Hound water dancing scene. That location with all the waterfalls is maybe the most beautiful place I’ve ever been. Iceland just looks like another world. The landscapes, they’re just a bit different, a bit fantastical, so it fit what we’re doing perfectly. Iceland really looks stunning. This time around the shooting was in the summer. Lots of sunlight, relatively warm weather? Nikolaj, since we spoke last year we’ve seen that your character has become more human and likable. Do you feel that progression continues this season? Nikolaj: I think that the key here is that—what’s great about is that a show like this has so much time to learn more about the characters. 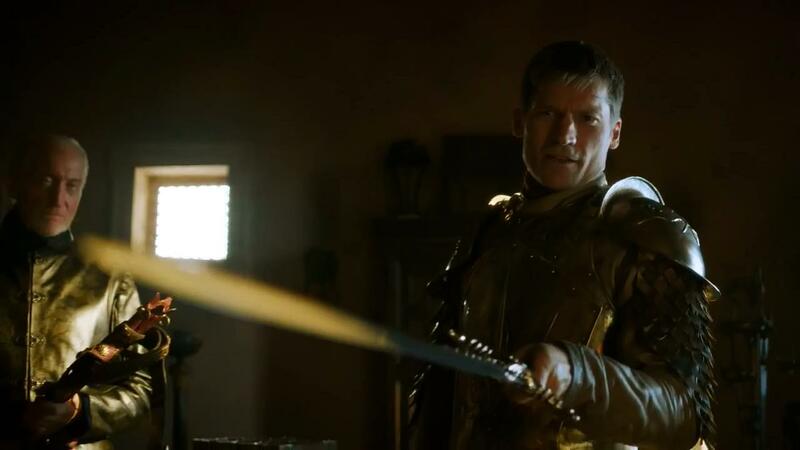 There’s no question that at the beginning you knew nothing about Jaime Lannister, you just saw his actions, but you didn’t know why he acted like he did. Now we’ve learned a lot more, and a lot of things has happened. When we meet him at the start of this season, it’s a few weeks since he’s returned and he’s now Lord Commander of the Kingsguard. The whole Lannister family is there, and Jaime deals with his father’s expectations, with Cersei—and that’s of course quite complicated—and his brother is also in a very tight spot and he needs Jaime to help him. He has Joffrey, his nephew/son, who’s being a bit of pain… and of course he has to deal with Brienne, who keeps reminding him of this promise he made. And of course he lost his hand, which is quite a bit of a problem. It defined him in his own eyes, and in the eyes of the world as well. He puts on a very brave face, if you will… Perhaps I shouldn’t give anything more away. Obviously, it’s very important him that people respect him, and even fear him in a pure physical way. It’s important that people believe he’s dangerous. But whether or not he still is, that’s another question. As to whether he’s more vulnerable… yes, of course, he’s definitely changed quite a bit. He’s for the first time met someone outside of the family whom he thinks he can trust and respect. He’s not quite aware of that when we start this season, but it’s there. There’s a scene from the first season, where Tywin tells him he wants Jaime to become the man he was always meant to be. ... and maybe this season is about that; not necessarily the man Tywin wants him to be, but the man he wants to be.